1) WATER IS ONE OF THE MOST ABUNDANT SUBSTANCES ON OUR PLANET. All but three percent of it is contained in the oceans, which cover 71 percent of the Earth’s surface. They’re home to some 97 percent of the earth’s biomass – overwhelmingly represented in microscopic organisms. 2) Water is wet because its molecular structure of one oxygen atom and two hydrogen atoms creates weak positive-negative bonding, making water molecules just strong enough – and weak enough – to link, break-up and re-link billions of times a second. Because of this, water pours and flows, has high surface tension even though it’s…watery…and fish and we humans can see and swim through it easily. 3) Water is the near-universal solvent because its polarized components interact with other molecules’ positive and negative charges to break them apart (or to reconfigure its own atoms) and form new bonds with them. 4) In contrast, fats, oils and the sticky resins from pine needles don’t dissolve in water because their molecules aren’t charged, preventing interaction with water’s hydrogen links. 5) Substances essential to life processes like carbon dioxide, oxygen and nitrogen are easily exchanged between the atmosphere and seawater, dissolving at the surface – and, also, readily transferring back. 6) The deep oceans are major holders of carbon, both as calcium carbonate stored in planktonic fossils that coat the ocean floor and as hydrogen carbonate dissolved in seawater. If carbon-laden waters are drawn into the deep ocean, they remain there for centuries before the great oceanic conveyor belt returns them to the surface. 7) Inorganic salts account for seawater’s “salinity.” These represent less than four percent of the oceans’ mass, many in trace amounts. A half-dozen – sulfate, magnesium, calcium, potassium, sodium and chloride – make up more than 99 percent of them. 8) Sodium and chloride – the components of “table salt” – account for the overwhelming bulk of them. They’re what make seawater taste “salty. 9) The degree of seawater’s salinity varies from place to place. Enclosed basins like the Red Sea are saltier than open oceans because evaporation removes more pure water than it acquires from rain or river flow. 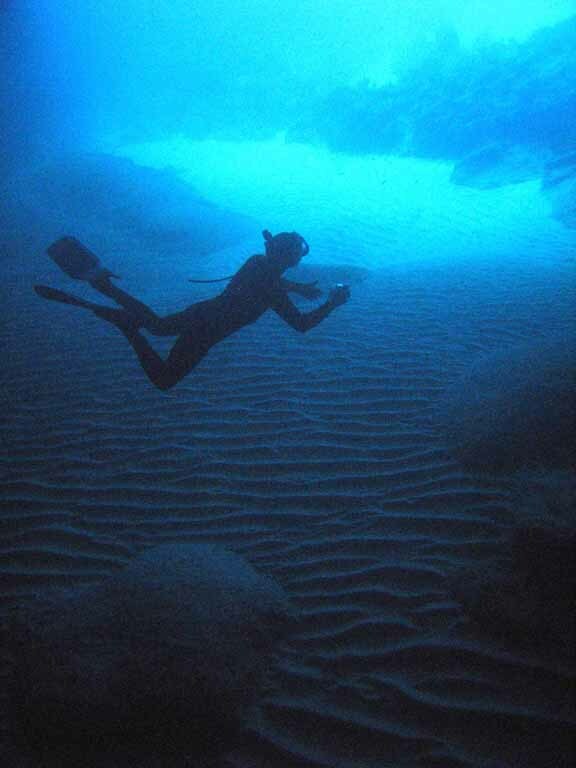 A freediver in the Blue Grotto in Curacao. 10) Water controls our climate – and not just in terms of its presence in rain forests or absence in deserts. It’s extremely slow to gain or lose heat and is a superb mover of energy. The Caribbean warmth the Gulf Stream carries up and across the Atlantic keeps temperatures in northern Europe some 16° F (9° C) higher than those in similar latitudes in other parts of the world. 11) Most substances in our world require extreme temperatures to boil or freeze but water switches between solid, liquid and gaseous states in a narrow, human-friendly temperature range. Whether frozen into ice, sloshing around as a fluid or floating around in a gaseous state, in molecular terms water is all the same substance. 12) As liquid water cools, the constant motion of its molecules slows down and they become packed more closely together. Massed tightly enough, they stop moving altogether – they’re in a frozen state; water has become ice. 13) In the process, water molecules perform a neat trick: like nearly all other liquids, water becomes more dense as it cools but alone among liquids it expands just before it reaches the freezing point. Its molecules reconfigure into an orderly, more-open structure. This new arrangement makes ice less dense than the water it came from, causing it to float at the surface. 14) In its liquid state, salt water is denser than fresh water – about 3.5 percent more so in the open ocean (forcing divers to pack on more weight to achieve neutral buoyancy in seawater than in freshwater). And, since salts slow down seawater’s re-ordering of hydrogen bonds, the increased density of saline water lowers the temperature at which it will freeze to about 29° F (-1.67° C). 15) Still, when water freezes the resulting frozen substance is freshwater, no matter whether it forms in lakes, streams or the ocean. The freezing process causes the ions to drop out – Arctic and Antarctic icebergs, though floating in seawater, have little salinity and are almost pure freshwater. 16) The melting of ice bergs and ice floes has no effect on sea level; the space it occupies is greater but water in a frozen state weighs the same as water in a liquid state. 17) It’s the ice bound up in land-based glaciers, especially those in Antarctica and Greenland – that will play a role in any sea level rise due to global warming. 18) About 75 percent of the Earth’s freshwater is in glaciers but the apparent rapid melting of glaciers has many scientists worried. 19) The West Antarctic ice sheet alone contains more than seven million cubic miles of ice. It’s estimated the water in this ice would raise world-wide sea levels some 20 feet if it slipped or melted into the sea. 20) These estimates are always changing but the constant is that it would be bad for us.